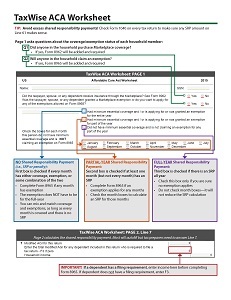 This one-page quick guide explains the ACA Worksheet in TaxWise. Understanding the ACA Worksheet is critical to avoiding erroneous shared responsibility payments for low-income taxpayers. This resource was developed for tax year 2015 and was incorporated into IRS Publication 4012. For updated information, please see IRS Publication 4012, Tab ACA: Affordable Care Act.